GE’s Masoneilan SVI II AP is a 4-20mA Intelligent Digital Valve Positioner offering advanced control technology for pneumatically actuated valves with a proven non-contact Hall Effect sensor for higher precision, reliability, greater flexibility, and ease of use. This solution delivers greater return on investment and provides maximum valve diagnostics capabilities. 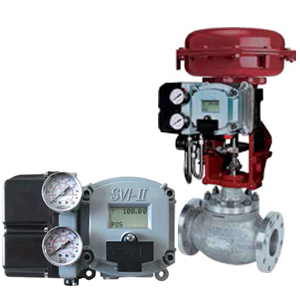 ValVue is a communication software tool used to configure, calibrate, and perform valve diagnostics with the SVI II AP utilizing HART communications protocol. A high flow option is available for optimized performance regardless of actuator size, eliminating or reducing the need of additional accessories (Booster, Quick Exhaust, etc). Universal Label with FM, FMC, ATEX, IEC, CE approvals. Mounting kits are available as standard for GE Masoneilan control valves as well as adaption for other control valve designs.